The material called natural mother-of-pearl has never a same color and pattern. In addition, the pattern, the color and the reflexibility of natural mother-of-pearl is changed by the angle throwing light and a situation. I would like to express the relationship between a man and a man and the one between a man and a thing by using natural mother-of-pearl. 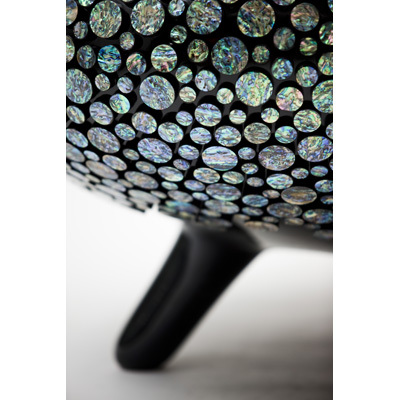 The pieces of countless mother-of-pearl surround the whole body with organic shape on Octopus chair. The angle throwing light of mother-of-pearl is changed and they maintain one organic shape. That is, Octopus chair and the mother-of-pearls attached on it do not show us any same shape even at any place. As if we did….